Light and colour – those two essential elements that transform a painting into a work of art – are most spectacularly represented in the works of the great impressionists. 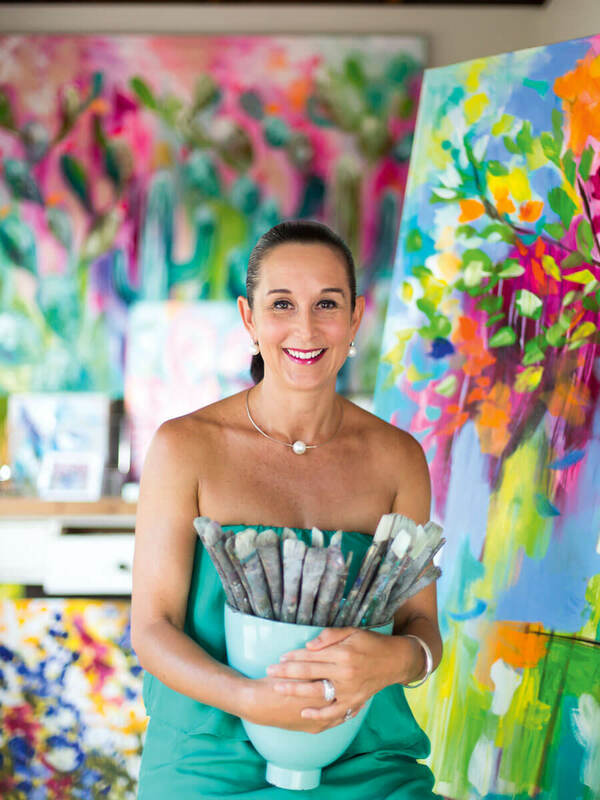 It’s no coincidence that Sunshine Coast artist Amanda Brooks’ dazzling canvases are reminiscent of those works – she admits that the impressionist painters, particularly Claude Monet, are her greatest influence. “I’m very inspired by the old masters of impressionism,” says Amanda, whose vibrant paintings burst with every hue. “My style is contemporary impression, I suppose. I like to paint something that looks like something, but still has an abstract feel rather than a photographic feel. Having been a full-time artist for the past 21 years, Amanda has an expansive portfolio of work, many of which hang in homes and galleries throughout the country. One of her trademark subjects is cattle – close-up abstract portraits – which she began painting to meet the demand of rural art-lovers. Birds of all shapes and sizes, bold florals and fruit also feature prominently in her work, as well as contemporary abstract landscapes and striking local landmarks such as Laguna Bay at Noosa. “The thing that I’ve realised over 21 years of painting is that there are so many different tastes,” says Amanda. “What one person loves, another one might not be attracted to. So I do actually try and spread myself out and do some of the artwork that’s very muted and neutral and earthy, and obviously people are drawn to those. It’s an amusing irony, however, that Amanda prefers neutral, not colourful, tones in her own home. “You wouldn’t believe it but I’m not actually a colourful person with my own decor,” she says. Working with acrylics, ink washes and oils on Belgian linen and high-quality cotton canvas, Amanda’s paintings are heavily layered and textured, which means she usually works on six artworks at any one time. Luckily, she has a huge shed at the back of her hinterland property where she has “a lot of room to make a big mess”. “Because there are a lot of layers to my paintings, I have to wait for a background to dry before I can go on to the next stage,” she says. Originally from South Africa with an Australian mother, Amanda came to Noosa to visit family and fell in love with it, “as everyone does”, deciding to settle there 22 years ago. One of the first jobs she had on the coast was as a florist, arranging flowers for the then Sheraton Hotel in Hastings Street. But it wasn’t long before she was drawn to the easel. She had trained in graphic design and business economics – a combination that may seem incongruous for an artist, but that proved to be the perfect choice for Amanda, who admits she loves marketing and selling her pieces. “I absolutely love the buzz I get out of marketing it and then selling it and finding a home for the artwork. That, to me, is just as much fun as painting it. “And I think that’s a good thing, because there are a lot of artists who are purely creative and not business-orientated, which means they need other people to promote their work. “I’m also quite a social person, so I do enjoy the interaction directly back from customers, whereas when you’re doing purely galleries, you don’t get that feedback. Amanda says a huge part of her work involves commissions, but she also loves welcoming people to the gallery at her home, where they can view her latest works or choose a print of one of the paintings; this side is managed by her husband Jason, who works full time in the business, allowing Amanda “more time to paint”. “I’m a very visual person and I’m constantly looking at things for inspiration,” she says. “I read a lot of interior design magazines to keep up-to-date, and I follow a lot of interior stylists on Instagram. I also offer an online in-situ service, where people send me photos of the room they want a painting for, and I offer suggestions. “Within reason, I do try and follow trends to keep up-to-date, but at the same time I also would love to know that the artwork is a classic piece that will go with them until the end of time. “I always encourage people to buy something they love, rather than just buy something because it’s on trend.